Family owned and operated! Find out more here about our business. Yes we sell worldwide! Check the shipping info here. Comprehensive range of home brew supplies. The best range in Wangaratta! Massive range of gas bbq’s, smokers & pizza ovens now in-store or online. Cake decorating supplies & top quality cookware is now available to purchase. ALDER & MAPLE: These two flavours are commonly used for smoking seafood, hams and bacon. APPLE: Light, sweet, delicate and fruity flavoured smoke, which is perfect for pork and poultry, as well as beef and lamb. HICKORY: A distinctive taste mostly used when smoking beef and pork. MESQUITE: Strong smoke, but sweeter than hickory, great with beef, pork, wild game, water fowl and nuts. A member of the fruit tree family, apple bisquettes produce a lighter, fruity and slightly sweet smoke aroma making it a traditional favourite for pork. They are also excellent with mild flavoured meats. The Beer Blend Bisquettes will give your food the flavor it deserves. We combined our popular maple wood with hops, making them perfect for beef, chicken, ribs, sausages or anything you want to add a toasty beer flavour. They’re also ideal for burgers and cheese. Cherry bisquettes are a sweet and flavourful wood meaning they pair perfectly with smoking chicken and cheese. Cherry flavour bisquettes can also provide a mild smoked flavour for beef and pork. The Hunter’s Blend Bisquettes will give your food the flavor it deserves. We infused rosemary, thyme, and black pepper with our flavorful maple wood bisquettes to bring a warm and woods aroma and flavor to your food. These bisquettes pair well with game meat, poultry, fish, lamb, beef, and vegetables. 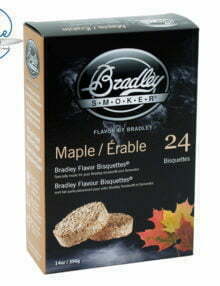 Maple bisquettes have a smooth and mild flavour with a slightly sweet aroma. They pair perfectly with seafood, poultry, wild turkey, vegetables and cheese. Hickory is an extremely popular wood for smoking and considered by many to be the best wood for pork. Also excellent with Hickory’s full rich flavour are beef, venison and wild game. Straight from the U.S, get the best out of your smoker and BBQ with these 100% natural wood chunks. Use as a stand-alone fuel source or use in combination with lump charcoal or briquettes. Made from 100% natural American hardwood, these pellets are larger, burn longer and contain almost no dust compared to other pellets. The aromatic blend of black oak, hickory and mesquite produce subtle flavours without overpowering your food. 100% natural Australian wood chunks.